The prevalence of obesity is continuing to rise. A report published in February 2010 by the National Heart Forum predicts that by 2020, 41% of men aged 20-65 and 36% of women of the same age will be obese. A further 40% of men aged 20-65 and 32% of women are predicted to be overweight. Obesity is associated with a reduction in life expectancy of between 3 and 14 years primarily due to increases in risk of cardiovascular disease and certain cancers. The Flour Advisory Bureau, NABIM and the Federation of Bakers are working hard together to support the nutritional advice given out by doctors, nutritionists, dietitians and government about diet and health. Obesity also contributes to a substantial burden of ill health especially type 2 diabetes. As the nation struggles to keep its weight down the flour and bread industry has responded by actively promoting the proven weight loss benefits of a diet low in fat and high in carbohydrates, coupled with exercise. The Flour Advisory Bureau commissioned an independent literature review in September 2003 “Tackling the Weight of the Nation” – which considered proven strategies in delivering sustained weight loss. The report pulls together the very extensive research in relation to low-fat, high carbohydrate diets and shows conclusively that an effective, realistic and achievable strategy for long-term weight management with clear health benefits does exist. Produced by Dr Susan Jebb and Dr Toni Steer of the Medical Research Council (MRC) Human Nutrition Research in Cambridge, the peer reviewed report includes evidence from lifestyle intervention studies in Europe and North America that show that overweight individuals who become active, reduce the fat in their diet and include unrefined carbohydrates can significantly reduce their weight over several years. Modest weight losses of 5-10% of initial weight over a 4-year period have been shown to more than halve the new cases of diabetes. Plan regular meals, including breakfast. There is increasingly persuasive evidence that our diets have a significant effect on our long term health. Not only does being over or underweight lead to health problems but so can not eating enough of the right foods in the right balance. 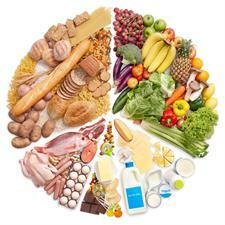 As a guide experts have produced the food platter to demonstrate the proportion of what foods should make up our diet. About a third to a half should come from complex carbohydrates such as bread. In the UK we don’t eat enough complex carbohydrates. Our diets should also contain plenty of fruit and vegetables. Again in the UK we need to eat more of these – at least 5 portions a day. What we should cut back on (but not exclude) are fatty and sugary food and drinks. It is also these foods that contain the highest number of calories gram for gram and therefore cutting back can help if you want to lose weight. This food plate picture makes healthy eating easier to understand by showing the types and proportions of foods needed to make a well-balanced and healthy diet. Bread provides an excellent source of many nutrients not least fibre (particularly in wholemeal bread), something studies have shown we all need to eat more of. But white bread contains calcium, and all bread has iron, the B vitamins niacin and thiamin, as well as a host of other micronutrients. The Flour Advisory Bureau, nabim and the Federation of Bakers are working hard together to support the nutritional advice given out by doctors, nutritionists, dieticians and government about diet and health. The Flour Advisory Bureau worked with a team of experts and nutritionists to develop the ultimate eating and lifestyle plan, following the recommendations outlined in the report. The Vitality Eating System targets women who are interested in either losing or maintaining their weight whilst eating healthily. The system provides consistent, accurate and proven information based on sound science. By providing a healthy long-term option to faddy and quick fix diets, the system focuses upon effective, realistic and practical dietary advice for consumers. The healthy eating plans are regularly updated and also include dedicated menus for particular occasions, for example, Christmas. The system was based on pioneering work undertaken by the Grain Chain with the Medical Research Council. Leading obesity expert Susan Jebb studied the studies into weight loss interventions and found that the best way to lose weight and keep it off was essentially a reduced calorie, low fat diet including plenty of complex carbohydrates, like bread, coupled with exercise. Both Tackling the Weight of the Nation, as the resulting report is called, and the Vitality Eating System, can be downloaded from the publications section of the Flour Advisory Bureau website.